Erin Keleske is the new Fund for Lake Michigan Communication’s Assistant! The Fund has supported the WATERshed program for the past several years. Erin grew up in Racine and we were thrilled to learn that she has experienced the benefits of environmental education programs like the WATERshed program. Growing up in Racine, some of my most memorable days in elementary school were spent at River Bend Nature Center. From hiking through the woods to searching for living things in the ponds, I learned some of my most valuable lessons there. But I often wondered how someone could play in the same river I played in or look at the lake that I saw and not do everything they could to protect it? Nancy Carlson, a naturalist and environmental educator at Hawthorn Hollow Nature Sanctuary and Arboretum in Kenosha, may have finally provided an answer: kids are not playing in the river. A shocking number of students in Racine and Kenosha counties have never actually visited Lake Michigan, let alone the Root and Pike Rivers, according to Carlson. “So here they are, citizens of the Great Lakes, yet they’re not studying the Great Lakes,” she says. Carlson is doing what she can to change things. She’s spent the last ten years filling this deficit with the WATERshed Program, a fun-filled day of wading through the water, hands-on science, and an invaluable lesson about their community and local ecosystem. 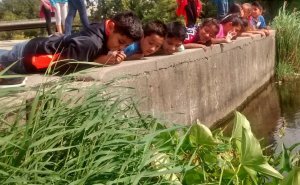 They test water quality, learn about river geology and aquatic species and, most importantly, play outside. Teachers whose students participate in the WATERshed program say the children are becoming engaged with science and nature in a way they never could in the classroom. Before the WATERshed program was launched in 2009, students in Racine Unified School District were not required to study the Great Lakes as part of their science curriculum. Today, all students in the district participate in the WATERshed program. Fourth graders spend the day at the Root River REC and 7th graders refresh what they learned at Lake Michigan. Carlson has worked tirelessly to ensure the program is both financially and physically accessible to students of all backgrounds. The program has expanded to include a field day for 5th graders in Kenosha County. Carlson hopes to reach 100% participation in Kenosha Unified School District, creating a “water literate” community across southeastern Wisconsin. I can personally attest to the seeds planted by environmental education programs like the WATERshed program. I am an environmentalist today because of River Bend Nature Center. Thanks to the work of Nancy Carlson and countless volunteer educators, someday every student in Racine and Kenosha may say the same about the WATERshed program.